The first recipe for this cake was published in 1871. It was titled “Snow-Drift Cake”. A similar recipe entitled “Silver Cake” appeared ten years later. 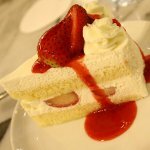 In 1884, the name “Angel cake” was mentioned for the first time. Two years later the cake was first called “Angel food cake”. The cake was so named due to its airy light texture that reminds of the food of the angels. Angel food cake is a type of sponge cake. It has a very light texture and taste because it is typically made with fine cake flour and includes egg whites whipped until stiff. To stabilize the egg whites, cream of tartar is added. Angel cake is usually baked in a tube pan or bundt pan and thus has a hole in the middle. Cake can be frosted with a simple glaze, but is more often served drizzled with some sort of sweet sauce. It is interesting to know that Angel food cake has a “counterpart” known as Devil's food cake. Devil's food cake is a type of butter cake, it is an airy and moist chocolate layer cake usually topped with rich chocolate frosting. Both cakes are very popular in America.